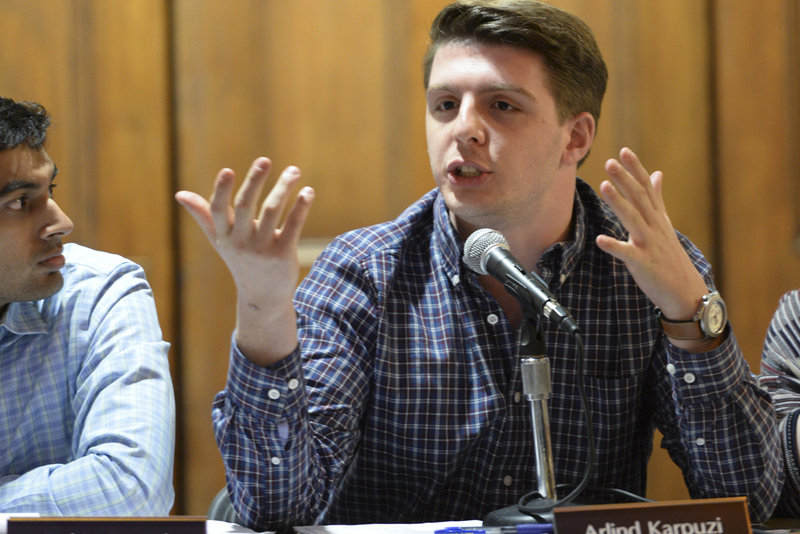 All of the candidates for Student Government Board president this year — including President-elect Max Kneis — considered town hall style meetings as part of the solution to engaging students in SGB. The two town halls that have already taken place in Nordy’s Place might give next year’s board ideas for running their own. At the now-monthly town halls, SGB suspends board reports — updates on initiatives it is currently working on — and instead devotes the time to listening to student concerns. The board began these town hall meetings in January as a way to encourage more student involvement. So far, turnout has been low. Despite a promising number of student voters in last week’s elections, only six students used this new avenue to voice their opinions at Tuesday’s meeting. Discussions touched on the difficulty of finding university policies to students looking for board support for the faculty and graduate student union. The board listened intently as members frantically scribbled notes and responded to each student’s request with an invitation to set up a meeting to discuss the matter further. In addition to town hall meetings, Harper said board members were available to talk to students at least 15 hours of the week: 10 during their mandatory office hours, as well as three board meetings on Tuesdays, Fridays and Sundays. Previously, students would have to wait for the open floor portion following board reports, which Kneis – currently the VP of finance and president-elect — worried could deter students from showing up. “The avenue of the town hall is not meant to address and solve issues — it makes us aware of issues that students are passionate about,” Kneis said. Two clubs on campus — Fossil Free Pitt Coalition and Pitt Progressives — used the time to update SGB on their efforts toward political, social and economic campaigns on campus. FFPC is pushing the board of trustees to divest $26 million of the University’s endowment from fossil fuel resources. Pitt Progressives outlined plans to make Pitt a sanctuary campus, meaning the University would protect undocumented immigrants. The group highlighted what this would mean for the University and asked SGB to work as a liaison between students and the administration. “We can’t speak about what the administration is going to do or is doing, but we can collect what students are thinking and figure out a way to get the students’ voices heard, because that is what we’re here for,” Harper said. Becca Tasker, the social media chair for Pitt Progressives, attended the town hall meeting to get their club engaged in the community as well as to hold SGB accountable. Sage Lincoln, an organizer with the Fossil Free Pitt Coalition, said she came to the meeting to keep SGB in the loop with updates on their efforts to encourage Pitt to divest from fossil fuels. Ultimately, she hopes SGB will pass a resolution in support of divestment as they have done in the past with other environmental and social issues, including the Bring Your Own Bag campaign and the real food challenge. “There’s no golden bullet, but [the resolution could] show the administration the student body stands in unison with this issue,” Lincoln, a senior geology, ecology and urban studies major, said. American Institute for Chemical Engineers requested $2,000 for a regional conference. The board denied in full. Pitt Rugby Football Club requested $1939.48 to attend the Cherry Blossom Tournament. The board approved in full. Engineers for a Sustainable World requested $1,870 to attend the ESM Conference. The board approved in full. Chem-E Car requested $1,880.80 for a regional competition. The board approved $1,879.20 and denied $1.60. Reformed University Fellowship requested $1,772.40 to attend the RUF conference. The board approved in full. Men’s Ultimate Frisbee requested $3,539.12 to attend the Stanford Invitational. The board approved in full. Musical Theatre Club requested $1,662.04 for production of The Rocky Horror Show. The board approved in full. Exercise Science Club requested $3,397.57 to attend the ACSM Health and Fitness Summit. The board approved $1,855.80 and denied $1,511.77. Pitt South Asian Student Association requested $2,432.54 for their 2017 show. The board approved $2,326.64 and denied $105.90.